Mac Murrett is an Advanced Developer at Vanteon. He lives in Rochester, NY, where everything closes at 10 PM. This gives him plenty of time to think. Mac graduated from SUNY: University at Buffalo with a degree in Mathematics. 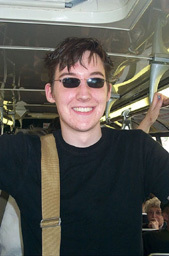 He has been programming Macintoshes since he was 12 years old, and recently won the Best Hack Contest at MacHack 2001. Nonetheless, he swears up and down that his name has nothing to do with the computer.